Burnley were knocked off the top of the Championship table after losing for the first time in 12 league games at Huddersfield. Oliver Norwood put Huddersfield ahead with a stunning long-range volley before James Vaughan added a second with a penalty. Danny Ings pulled one back when he ran through one-on-one with the goalkeeper. Michael Duff was sent off late on as the Clarets suffered only their second league defeat of the season. They move to second spot following Leicester City's win over Millwall. Burnley arrived at the John Smith's Stadium as the side in form, having won eight and drawn four of their last 12 games. However, it was the home team who dominated the early stages. Vaughan's swirling shot from 30 yards had Burnley keeper Tom Heaton diving at full stretch, before former Claret Martin Paterson struck the post with a header from Paul Dixon's cross. Ings fired over midway through the first half but it was the Terriers who had the best chance of the first 45 minutes when Vaughan fired over from little more than six yards. Sam Vokes shot marginally wide soon after the break but just as Burnley seemed to be improving, Huddersfield took the lead in stunning fashion. Adam Hammill lofted a corner away from the box and towards Norwood about 30 yards from goal and the midfielder struck a first-time dipping effort that beat Heaton at his near post. Moments later, Huddersfield doubled their advantage as Duff was adjudged to have handled the ball inside the area and Vaughan stepped up to coolly place the penalty beyond Heaton. Burnley responded by going on the attack but they were denied what seemed a certain goal when the ball fell for an unmarked Ings in the middle of the area and his powerful strike was thumped away by Huddersfield goalkeeper Alex Smithies. However, they ensured a tense finish to the game when Ings raced through on goal to beat Smithies with a low shot. But Burnley were reduced to 10 men late on when Duff was dismissed for a second yellow for a foul on Vaughan and Huddersfield closed out the remainder of the game. "I am really proud of the lads and even if we hadn't taken the three points I would have been delighted. "In the second half, like the top teams do, they came at us and there are some good players there. "In Sam Vokes and Danny Ings they've got two lively strikers who only need a sniff." "I believe in referees but it's frustrating for us and frustrating for the fans. "I am always truthful about my team and we were second best in the first half. "Huddersfield raised their game but that's what happens when you're at the top." Match ends, Huddersfield Town 2, Burnley 1. Second Half ends, Huddersfield Town 2, Burnley 1. 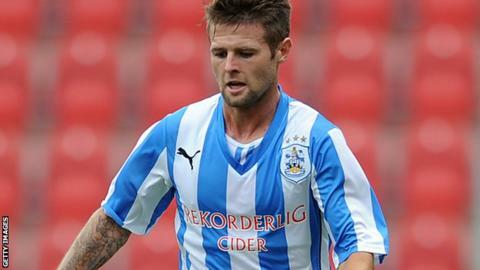 Oliver Norwood (Huddersfield Town) wins a free kick on the right wing. Foul by Brian Stock (Burnley). Attempt missed. Kieran Trippier (Burnley) right footed shot from more than 35 yards is close, but misses to the left. Adam Clayton (Huddersfield Town) is shown the yellow card for hand ball. Hand ball by Adam Clayton (Huddersfield Town). Attempt blocked. Junior Stanislas (Burnley) right footed shot from outside the box is blocked. Assisted by Brian Stock. Second yellow card to Michael Duff (Burnley) for a bad foul. Daniel Ward (Huddersfield Town) wins a free kick on the right wing. Hand ball by Sam Vokes (Burnley). Offside, Huddersfield Town. Daniel Ward tries a through ball, but James Vaughan is caught offside. Attempt blocked. Brian Stock (Burnley) right footed shot from outside the box is blocked. Attempt blocked. Sam Vokes (Burnley) right footed shot from the centre of the box is blocked. Assisted by Danny Ings. Substitution, Burnley. Keith Treacy replaces Scott Arfield. Substitution, Huddersfield Town. Calum Woods replaces Adam Hammill. Goal! Huddersfield Town 2, Burnley 1. Danny Ings (Burnley) left footed shot from the centre of the box to the centre of the goal. Assisted by Sam Vokes following a fast break. Offside, Huddersfield Town. Oliver Norwood tries a through ball, but James Vaughan is caught offside. Offside, Burnley. David Jones tries a through ball, but Scott Arfield is caught offside. Sam Vokes (Burnley) is shown the yellow card. Offside, Burnley. Junior Stanislas tries a through ball, but Sam Vokes is caught offside. Kieran Trippier (Burnley) wins a free kick in the attacking half. Attempt blocked. Sam Vokes (Burnley) right footed shot from outside the box is blocked. Assisted by Danny Ings. Foul by Daniel Ward (Huddersfield Town). Substitution, Huddersfield Town. Daniel Ward replaces Martin Paterson. Adam Hammill (Huddersfield Town) wins a free kick in the defensive half. Joel Lynch (Huddersfield Town) wins a free kick on the left wing. Offside, Burnley. Kieran Trippier tries a through ball, but Scott Arfield is caught offside. Foul by Oliver Norwood (Huddersfield Town).